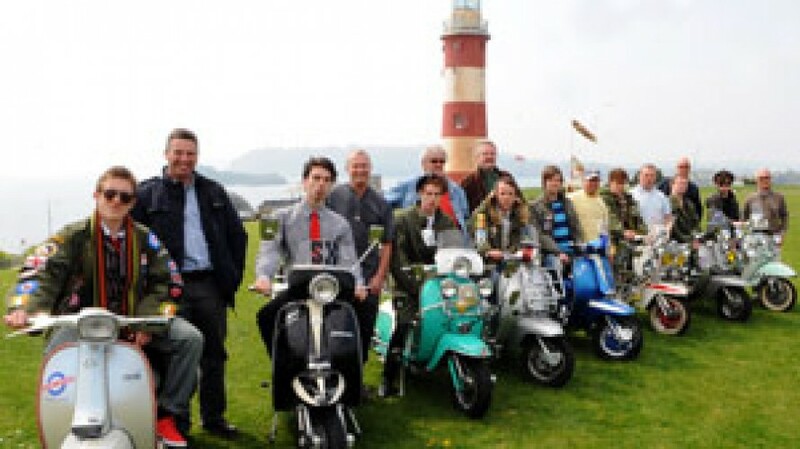 The cast from Quadrophenia took time out from rehearsals for a publicity photo call on The Hoe either this week. The scooters were kindly supplied by local scooter riders (pictured). The compelling coming of age story is brought to life in this original stage adaptation of the legendary album. The evocative world of sixties Britain provides a colourful backdrop to Jimmy’s journey. Pete Townshend’s score captures the excitement of a nation on the brink of change. Quadrophenia documents a culturally significant moment in Britain, the influences of which are still seen today in music and fashion. The story takes a snapshot of one of the most interesting and energising times for pop culture in Britain. The album Quadrophenia was released by The Who in 1973 followed by the iconic film in 1979. Rolling Stone magazine and VH1 have named it one of the 100 Greatest Albums of all Time. The film which became a cult hit was directed by Franc Roddam and starring Sting, Phil Daniels, Leslie Ash, Toyah Wilcox and a young Ray Winstone, it captured the tense and at times violent atmosphere in the UK in the mid 1960s. This brand new stage adaptation of the album is directed by Tom Critchley and is co produced by the Theatre Royal Plymouth and opens on Sat 09 May. Tickets are available from the Theatre Royal box office on 01752 267222 or *“click here”:/prod-productions_details.asp?pid=174*to book online.